At one point a car drove by and the dust from the gravel road engulfed my brother Brian and me and an Audubon Society lady who was bicycling by and stopped because my brother is so talkative (seriously, no one for miles around and Brian strikes up a conversation with someone going by on a bicycle). How cool is that! 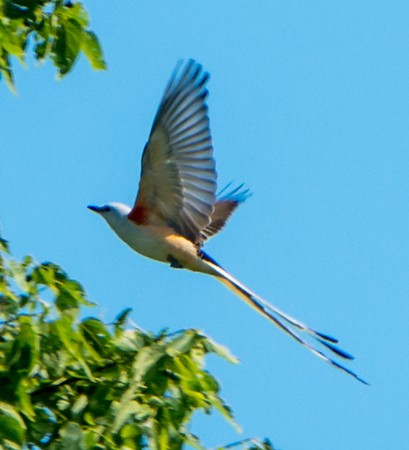 Look at that tail–looks like something from the tropics. 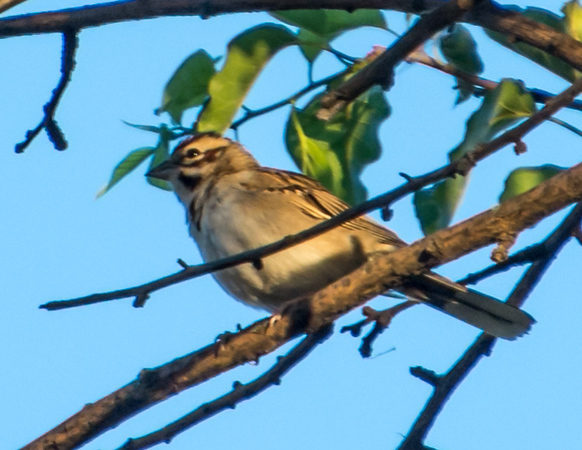 We also saw a Lark Sparrow, a bird whose range just barely touches that part of the country, in the very same tree as the Scissor-Tailed Flycatchers. You can’t make this stuff up. This German import came to St. Louis in 1870 and spread only a little further into Illinois in all that time, which is remarkably similar to my own family history (and now that I think of it, I’m drawn to electrical substations, too). The House Sparrow, which arrived there at the same time and is more aggressive and adaptable, appears to have kept them out of other areas. 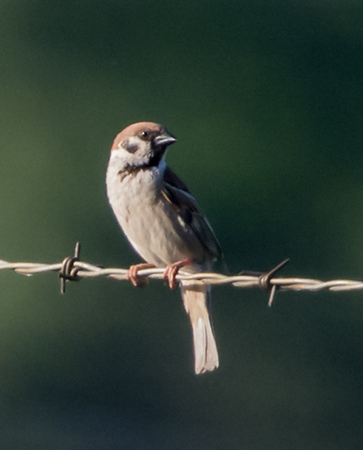 They do not have any gray on their head as the House Sparrows do, but they do have a distinctive dark ear patch. 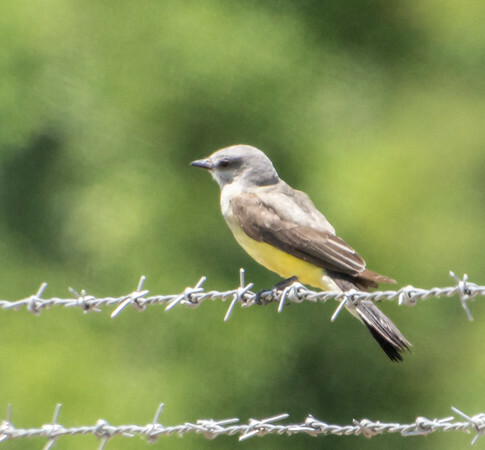 The Western Kingbird is “an eye-catching bird with ashy gray and lemon-yellow plumage,” as Cornell puts it. They will chase Red-Tailed Hawks and American Kestrals, at which point they flare crimson feathers under their gray crowns. So that’s the Havana Triangle. 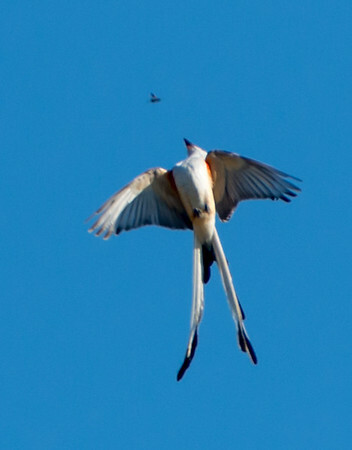 It’s a cool place out in the middle of absolutely nowhere that often sports unusual birds. Why? The truth is out there. Wow that is spectacular, what a beauty. Thanks! I don’t know why the pics are not sharper, really, but I remember how bright it was out there and there was a lot of fringing around the birds in the sky, so maybe that was it. 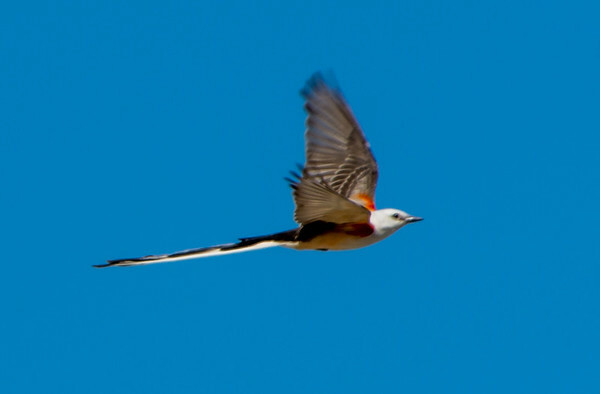 The Scissor-Tailed Flycatcher is such a cool bird. Ummm, did you just do what I think you did…. hmmmm, I guess I can blame myself and my ridiculously huge backlog for leaving the door open on that one. First off kudos for another post – getting into the swing of it now (for the others, years have gone by before we have received one post.. much less the avalanche of posts as of late – way to go). A quick clarification – Ron is the social butterfly in the family although I might have been trying to preempt any unwanted scrutiny being out in the absolute middle of nowhere with a healthy amount of camera equipment between us – Not the first time this has happened, we were down in the same area when a truck drives up (somewhat in the middle of nowhere) and two guys jump out with hunting bows and and arrows leading to some tense moments (me long distance runner, Ron sacrificial lamb you do the math). 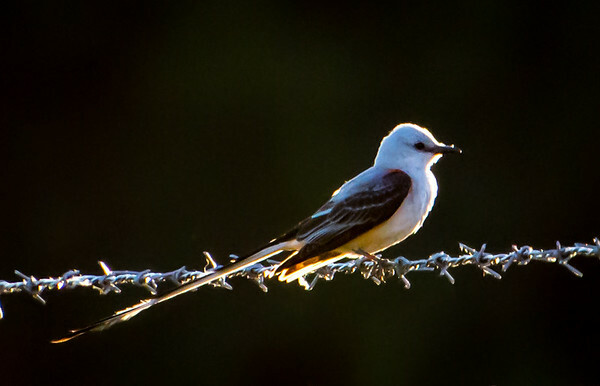 I have to agree with B. from the UK, the Scissor-tailed Flycatcher is an absolute stunner and super stoked he was able to get it in the tin after traveling down. 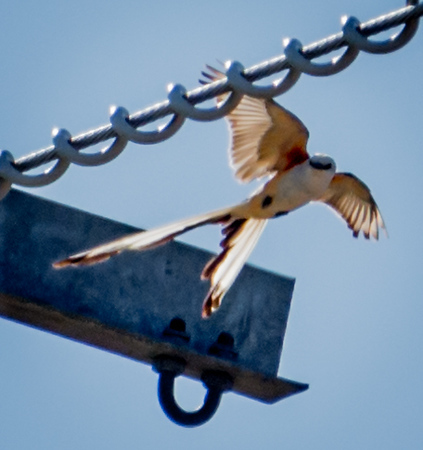 Thanks for sharing this truly bizarre birding location – pretty sure the electrical field that is bringing those exotics in are doing horrible things to our bodies. Thanks for commenting! We should try to get there again this summer.